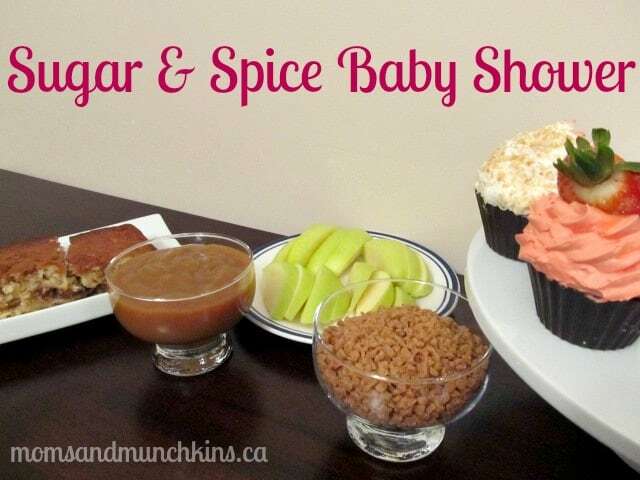 A Sugar and Spice Baby Shower is perfect for a gender neutral party. With a selection of sweet treats and spicy appetizers, there’s sure to be something for everyone! The menu for a Sugar and Spice Baby Shower can include two small buffet tables. One filled with sweet treats and the other with spicy foods. A fun game idea that’s perfect for this theme is a test of your senses. This game has two parts – one sweet & one spicy. For the sweet game, line up some sweet baby food on the game table along with plenty of spoons for tasting (no one wants a double-dipper so make sure you have plenty of spoons by each jar). Remove the labels to the baby food so that guests don’t know what the flavor is. Have guests use their sense of smell and taste to write down their guess on their answer sheet. The second portion to this game is a sniff test. Cover up bottles of spices with plain white paper. Label each of the jars with a number. Guests will have to sniff the spices & take a guess as to which spice it is. Guests can write their guess down on their answer sheet. The person with the most correct answers can win a small prize. A fun idea for treat bags is to give each guest a lollipop and a jar of spicy popcorn salt. Not the most common pair, but perfect for this party theme. For more baby shower tips, theme ideas and free printable games, please see our Baby Shower page. For unique baby shower favors and gifts, check out the adorable selection on Beau-coup (a Moms & Munchkins affiliate code). We’re always adding new party ideas. Follow along on Facebook, Twitter, Pinterest and Bloglovin’ to never miss an update.